Create a healthier, happier workplace. La Vida Laguna offers group health and wellness activities such as yoga, meditation, sound baths and more. In this age of anxiety and information overload, more people are turning to the ancient wisdoms for wellness practices that calm and focus the mind, engage the senses, and deliver harmony and balance. Transformational arts are being integrated into corporate wellness initiatives as science has proven their effectiveness. This experiential workshop introduces the principles of meditation, yoga, gratitude, 5-sensory stimulation, and living a conscious, meaning-filled life. In our busy, wired lives, we frequently lack the tools to deal with stress and overstimulation. This course teaches the many ways to calm the mind, access intuition, and overcome conflict with equanimity. A great way to start any retreat. Mindfulness 101 starts with light yoga, then moves into meditation. We then stimulate the senses with aromatherapy, Tibetan gong therapy, raw chocolate, and heightened awareness of sight and sound. We finish by providing the framework for living in daily gratitude. These modalities have been taught for hundreds of years, but are finding more resonance and value in the business world than ever before as a key to a more centered, fulfilling and peaceful life. There is something incredibly healing about practicing yoga next to the ocean while connecting with the soothing surroundings. 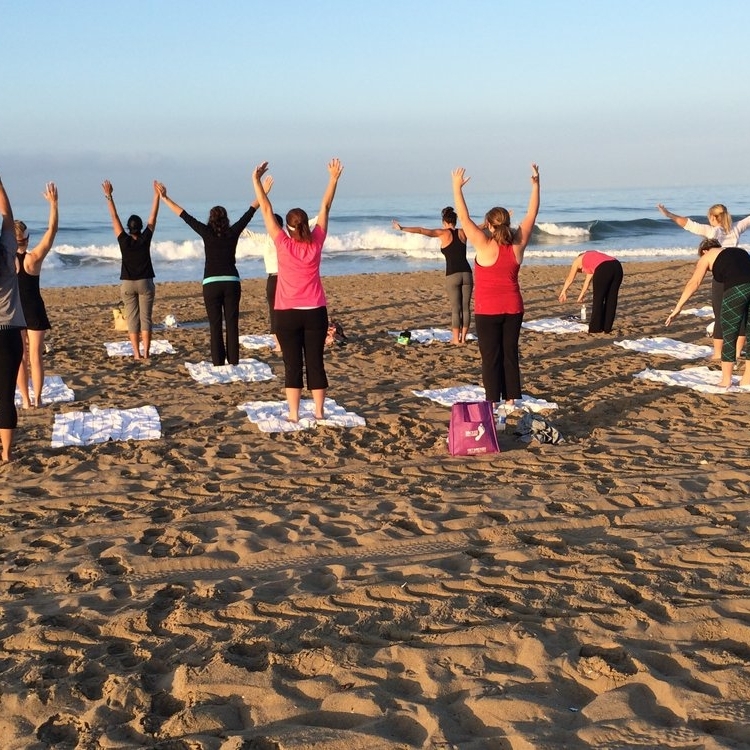 Many guests gush about watching the waves crashing while in downward dog, gazing upside down at the ocean. Sounds relaxing, right? Bring sunscreen and be prepared to get your Zen on! The science is out: meditation works and is a powerful mode of achieving and maintaining balance and wellbeing. Learn how it can be used to increase productivity and focus at work. We start by asking participants to ponder the four questions relating to self, purpose, hopes, and gratitude. While these do not require answers, they plant the seeds for subconscious manifestation and and self-realization. And then through breath and calming the mind we reach the place between the thoughts, known as “pure potentiality. Every get waves of pleasure from smelling a fragrant flower? The olfactory nerve is the fastest gateway to the brain, and strong producer of endorphins, sense memory, and feelings of wellbeing. In this workshop we work with a spectrum of natural, plant-based essential oils (both floral and herbal), and blend them into bath salts, misters or body oils. Everyone gets to label and take them home. Crystal healing is an alternative healing modality that employs natural stones and crystals. In this workshop or station we teach how crystals align with body parts (known as chakras), and moves energy to that area through an energy grid. Chakras correspond with emotional states, so whatever area in a person’s life is in imbalance, crystals can provide healing stimulation. Plus they’re beautiful. Participants will get to choose their own crystal to leave with. While food is a delight we covet and need daily, we rarely take the time to really honor, taste and savor our foods. In this class we introduce the healthiest of foods that incorporate the 5 tastes - bitter, sweet, sour, pungent and savory. But we will receive this life-giving sustenance with the reverence it deserves: acknowledging where it came from, how it was made, and then transported into our hands. We’ll then notice the texture, color, and smell before placing it on our tongue and truly sinking into the flavor. In this busy, go-go world where we want our food “fast,” this is a meditative practice that teaches a healthy, slower way to eat by chewing food thoroughly and releasing the enzymes and nutrients into the body. While walking is something we do daily, we rarely do it consciously. And with intention. In this add-on to any of our nature hikes, we learn to become more present with our surroundings, our breath, and each step we take on this earth, It is a walking meditation that engages and stimulates your 5 senses with the bounty found in nature. Based on the teachings of Vietnamese Buddhist sage Tich Nhat Hanh (author of “How to Walk”), it is a practice that can be harnessed in the everyday hustle bustle of life to access gratitude, grace, calm and wellbeing. An aquatic version of “Woke Walking,” Conscious kayaking takes advantage of the natural rhythms of the ocean to paddle certain sections in silence, feeling the “motion of the ocean,” smelling the briney air, experiencing the vibrant textures and colors. It allows us to sink deeply into gratitude for the life we are given. We even take a portion to come together, join the kayaks in a semicircle, and practice mindful meditation. The ocean has a powerful way of sinking us into contemplation - even meditation - and the negative ions produce feeling of wellbeing and contentment. Conscious kayaking can be an add-on to any of our kayak tours. Experience Laguna the way it’s been meant for over a century - as an artist. Join one of our professional art teachers in an open air course by the sea. Plein air is a Laguna tradition and means open air landscape art. This class is taught in one of our beach parks, with a demonstration first on painting with acrylics, and then hands on painting with your own easel and palette. Can also be paired with wine. Learn floral arrangement design from top floral artists with a seasonal flair. You’ll learn through expert demonstration and a hands-on workshop to design your very own floral creation. Whether its a centerpiece, holiday wreath, succulent arrangement, or seascape air plant terrarium, you’ll have a blast learning new skills and leaving with your very own floral creation. Take over a large local artist studio located in Laguna Beach. This is a hands on demonstration of blowing glass and participant will shape and blow the glass through a process of heating, cooling, and reheating to maintain the malleable properties until complete. Everyone will then create their own unique piece to be brought home with them.